WHAT: There were a lot of wonderfully strange toys to come out of the 1980s, but one of the most notable for its off-the-wall coolness was a line by Ideal Toys called Rocks and Bugs and Things. Basically, the line consisted of plastic monsters that on the outside looked like harmless rocks or (kind of) normal bugs, but when a button was pushed would show their true identities as horrific monsters out for blood and destruction. What many collectors remember most about the line, though, are the companion mini figures that came with the main attractions. 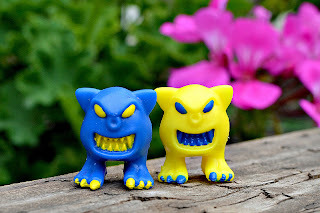 These were known as Mordles, and were basically one-inch tall, globby, disgruntled-looking gremlin creatures that kids could use as chow for the monster rocks and bugs. Well, fast forward a couple decades, and the Mordles accumulated a solid fan base among toy collectors. So much so that the little buggers begin fetching a pretty penny whenever they show up for sale online. Thankfully, collectors who are interested in Mordles but aren't willing to put the time or money into tracking down the originals can now easily add some to their collections. New versions of the Mordles came to be when John Kent of Toyfinity purchased the rights to some of the old Ideal Toys brands and decided to bring Mordles into the current millennium. And they're pretty damn great. I think it's safe to say new Mordles aren't going to go the way of New Coke. Mainly because the new Mordles carry all the same elements of the original figures that collectors know and love, and even make a couple genuine improvements. 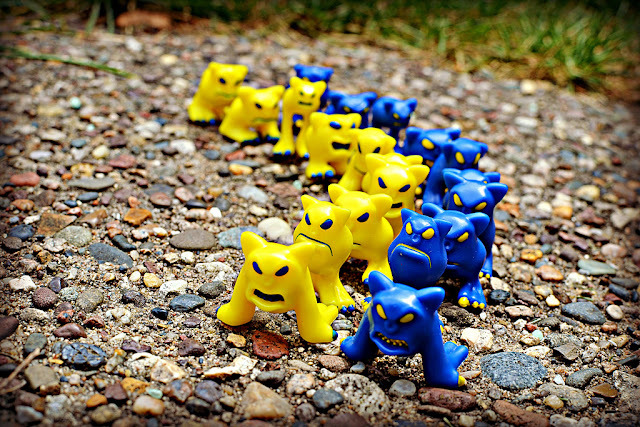 The initial release from the new line consists of two sets of 10 Mordles each: one yellow set with blue painted features (the "Standard" pack) and one blue set with yellow painted features (the "Crawler" pack). 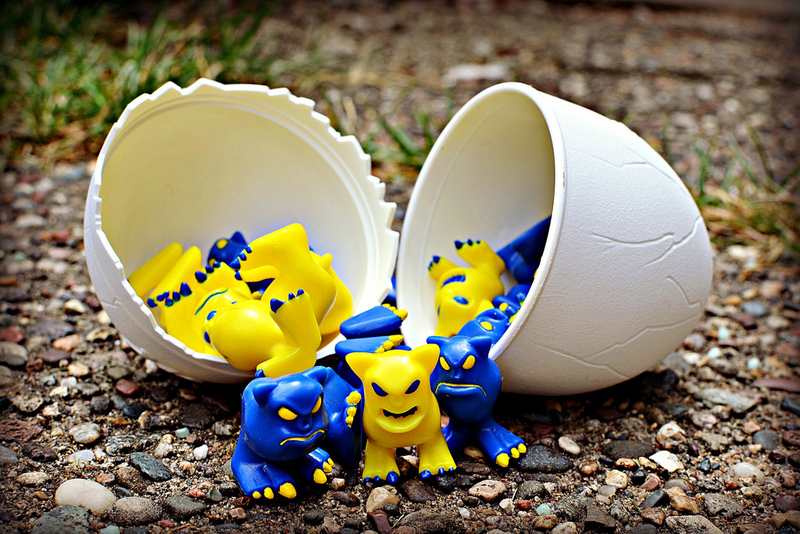 The 10 different sculpts are the same in each of the two sets (and essentially the same as the '80s figures), but the yellow set comes with a bonus egg, which pops open and can be used to store both sets of Mordles. The egg comes from the old Manglors toy line, which Toyfinity also has the rights to. A very nice addition! It's the perfect place to keep the Mordles when they're not out trying to avoid becoming something's dinner. As for the Mordles themselves, although they incredibly similar to the original figures, there are a couple differences that set them apart: For one, they are made of a softer plastic, so they have a slightly rubbery feel as opposed to the harder plastic of the originals. Not soft enough to be easily damaged, but soft enough to have a better texture when you hold them. They also have painted toenails, whereas their '80s counterparts do not, which makes them pop a bit more. Oh, and they no longer have copyright details on them, which is another element that means they shouldn't be mistaken for the originals. 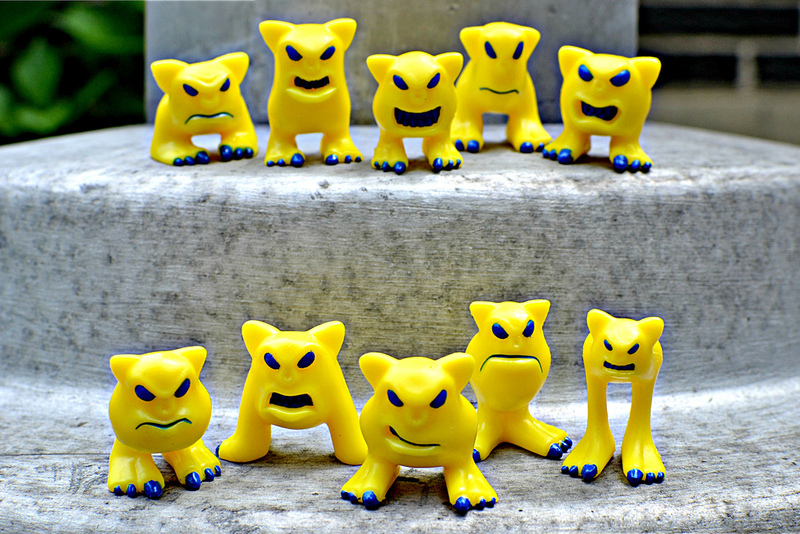 While all 10 different Mordles have a similar look (mean-looking facial features, pointy ears, big feet), there is some variation among them. Some of them are taller and skinner, while others are short and stubby. Some look amused in an evil sort of way, while others look like their best Mordle buddy just got eaten by a rock. And a couple have unique touches like stilt-like legs or backwards feet. Overall, the new Mordles serve up a very appealing brew of '80s nostalgia, collectability and effective simplicity, and from what I've seen around, they're pretty much an instant hit with mini figure collectors. 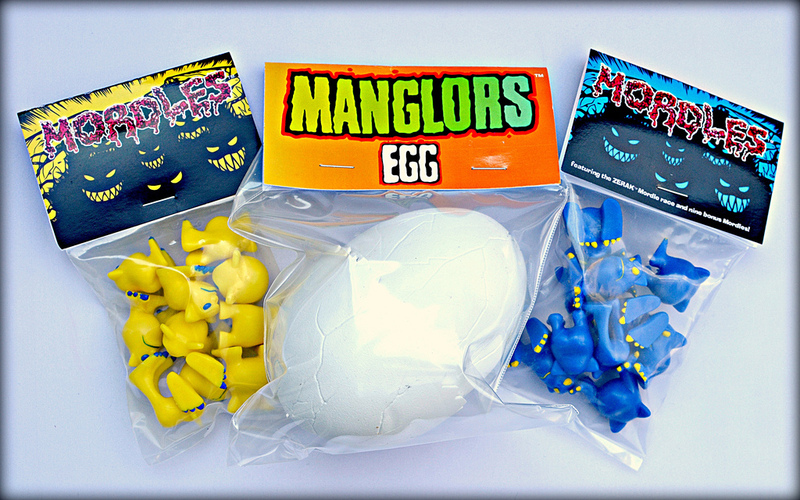 And at $16 for the yellow set with the egg and $12 for the blue set, they're very reasonably priced. Based on all these factors, I expect we'll see a lot more to come. Bring on the Mordle rainbow! WHEN: While original Mordles came out in the mid-'80s as part of the Rocks and Bugs and Things toy line, the new Mordles first became available in late June 2013. 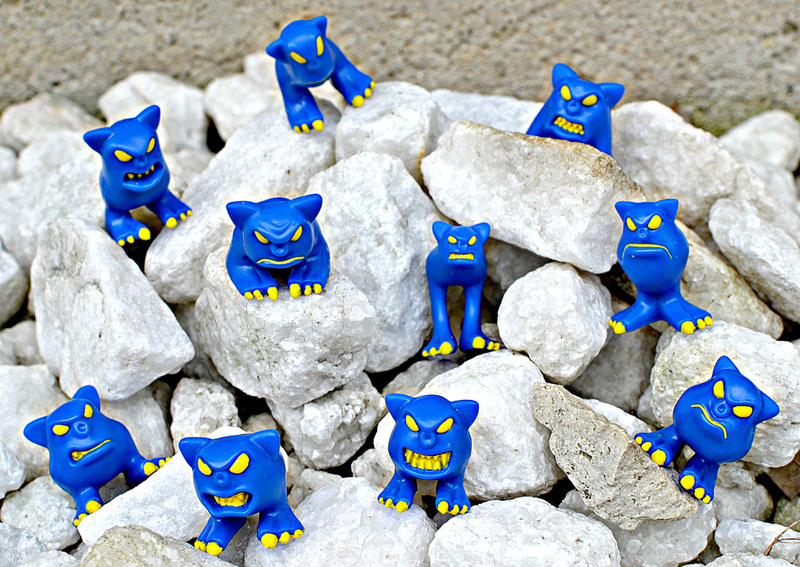 WHERE: The new Mordles are available through the Toyfinity online store. 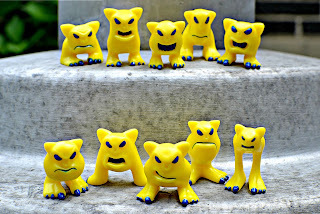 WHO: Original Mordles were released by Ideal Toys. The new Mordles are from Toyfinity, which describes itself as a "collaboration between toy industry professionals, historians and enthusiasts."